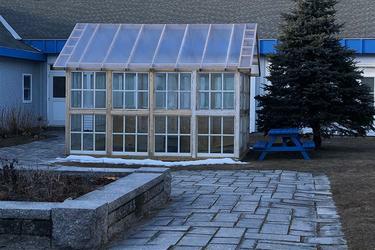 A brand new greenhouse has been installed in the outdoor common area. In preparation for the upcoming vote, the Future of Our Schools Committee has held two of three planned informational meetings this week, with a final meeting scheduled for Saturday, January 26. During a Monday evening meeting, FOOS Committee members sought to clarify issues pertaining to voting as well as the committee’s report, released last month. “There seems to be some questioning as to what the vote will do,” Union 76 Superintendent Christian Elkington said, addressing confusion voiced by community members recently on social media. The community referendum vote is also part of the strategic plan completed last year, he said. The ballot will contain two items, Elkington explained. The first prompts voters to choose either 1. to advise the CSD Board to close the high school and send students in Grades 9 through 12 off the Island or 2. to keep the high school open. The second item pertains to the degree to which the high school building will be used if it is to remain open: Either 1. it will continue to be used fully, as it is currently, or 2. just the gym and shop wings will be utilized, while the academic wing will be closed and students will go to the elementary school building for academics, Elkington said. Voting results will be tallied “at large”—or where and over-all, Island-wide majority vote will decide the fate of the high school rather than majority votes in each town—Elkington clarified in response to a question from a member of the audience. In either case—whether voters decide the high school is to remain open or not—a binding referendum will follow, Elkington said. If it remains open, bonds will be needed to finance building renovation and repair, and those requests will be put before the voters, he explained. If the upcoming vote favors closing the high school, a formal, binding referendum on its closure will likewise be put before the community, “…to see if the towns totally agree with that,” Elkington said. If the high school is to close, it would take at least a year for the school board and administration to plan and set that process in motion, Elkington said. While staffing and building operational costs would be reduced, other costs would rise, especially student transportation, Elkington said. Busing is budgeted at $352,600 this school year; however, it could cost closer to $639,800 if students are ferried to another single area school, and it could almost double if they are allowed to choose from multiple area high schools. District teaching and administrative staff—such as the Head of Schools position, currently occupied by Lynne Witham—would be cut significantly if the high school closes although Elkington strongly advises keeping a guidance counselor on board for the Island’s high school students. “I’m not saying they would be ignored [at another school],” Elkington said, but he noted the importance of a dedicated counselor. Closing the high school would also eliminate tuition revenue the district receives for high schoolers from other towns, and sending students off-Island could cost taxpayers an additional $1,000,000, based on a count of 80 students, Elkington said, adding that the Island towns would still be responsible for special education costs, too. FOOS Committee Chairman and CSD Board chairman Jane Osborne encouraged those in the audience to peruse the full committee report, which contains anecdotal information gleaned from people interviewed in other towns where schools were closed or where the option was considered, in addition to input from Deer Isle and Stonington community members and the students themselves. 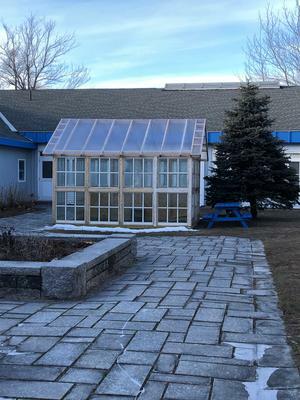 “We went out and interviewed 15 organizations and businesses on the Island to ask them what they thought the impact [of closing the high school] would be,” she said, and Elkington said the general response was that of serious concern over potential closure. If the vote favors keeping the high school open, Elkington suggested becoming a satellite school for the Hancock County Technical Center and developing a “sister school” arrangement with some other school—which could expand courses and electives for students via live video technology—as ways to remain viable and improve education on the Island. CSD Board member Skip Greenlaw spoke positively about the potential for fundraising on the Island to help defray construction and renovation costs. “There ought to be some way to go out and fundraise for some of those expenses.…I think we can make a substantial effort and raise a substantial amount,” he said. The FOOS Committee will hold a final public informational meeting on Saturday, January 26, at 9 a.m., at the high school. Voting will take place at both town halls on January 29, where polls will be open from 8 a.m. to 8 p.m. Absentee ballots (which are available until January 24, according to both town clerks, Osborne said) can be found at both town offices. Anyone concerned with the possibility of weather-related difficulties in getting to the polls on the 29th is encouraged to vote early via absentee ballot, Elkington said. The FOOS Committee report can be accessed in its entirety at the following websites: su76.org, dishs.org and dises.org. Hard copies are available at the superintendent’s office behind the high school building. 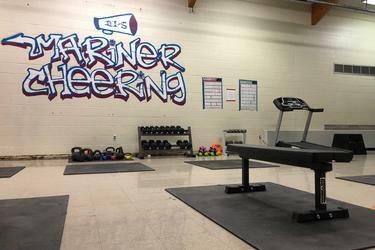 A brand new weight room is the newest addition to Deer Isle-Stonington High School, to be used by students, athletes and staff members. 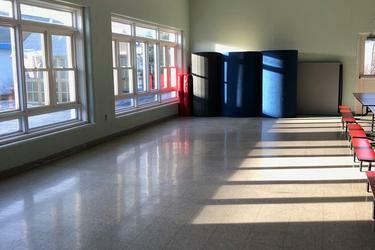 Space cleared out in the cafeteria at Deer Isle-Stonington High School allows gymnastics students from Deer Isle-Stonington Elementary School to practice their skills. 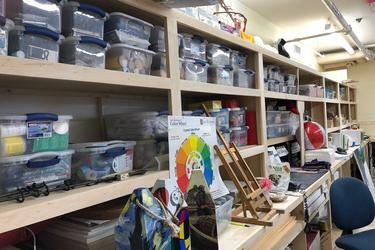 New shelves in the art room, made by Little Eagle Leach, were installed over the holiday break.